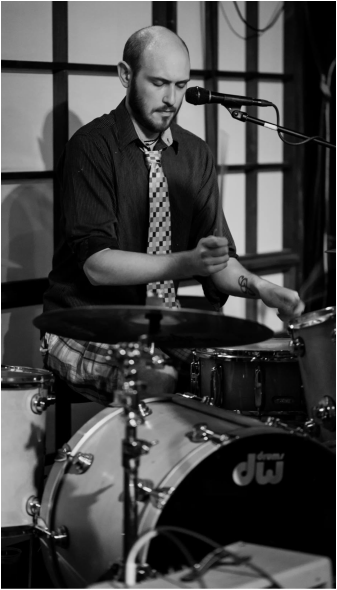 ​Since the moment he was born, Colin McCowan was destined to become a professional drummer. At the age of five, before he had a drum set, Colin was air drumming along to Nirvana and the Smashing Pumpkins. At the age of nine his parents caved and bought him a starter kit. He immediately fell in love. Since then he's played with several bands around the country, recorded with many different musicians, both on the kit and in the control room as the producer and engineer. Beginning in middle school at the age of 13, Colin began playing with his classmates and forming punk rock bands that could be heard jamming in garages and basements around DC and Maryland. After high school Colin moved to Texas to study recording arts. Down in Texas, Colin recorded many bands and played with numerous others while studying at MediaTech institute. He graduated with a certificate of completion in the Recording Arts program, and went on to play in a couple of very diverse acts, touring up to Detroit. Colin moved up to Minnesota where he is staying put. Since moving, Colin has played in a number of different bands as well as recorded drums for various artists. He played in the band Skittish and had the opportunity to play South By Southwest with them. He has played all over the cities with the country/cover band Whiskey Plates. Colin was recruited by the Irish Punk Rock band The Langer's Ball and he recently helped them record their 5th studio album. More recently Colin began performing with The Wild Colonial Bhoys, a Celtic Rock Group that has been playing Irish festivals around the country for over 15 years. He is also currently working with the Twin cities acts; July Fighter, a seasoned group of musicians who have been playing the cities for over five years. Colin is available for hire for studio work or for lessons. Click here to sign up for lessons!